Retirement doesn’t mean what it did in our parents’ day. The image of Granny sitting in her rocking chair, sipping tea, and knitting has been replaced by a vivacious Grandma and Grandpa roller blading or biking down the street on their way to play a round of golf before dancing the night away. Retirement is no longer feared as a time when you have outlived your usefulness. Now you look forward to retirement with excitement, a chance to do all the things you enjoy but put aside to raise your family. 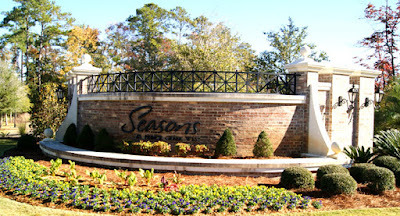 The gated community of Seasons at Prince Creek West was specifically designed for active seniors 55+ by Dock Street Communities. A well-established subdivision, it is now building new homes so you can choose a home that is ready to move into or choose from 10 fabulous floor plans. Some of the many features include things like amazing bathrooms offering huge glass showers with ceramic wall tiles and marble countertops, ceramic tile, hardwood flooring, and carpeting, gourmet kitchens, vaulted ceilings, screened porches, and more. The Majestic Series offers 5-floor plans starting at $275,900 with 2 bedrooms, two baths, dining room, den, living room, two-car garage, possible bonus room option. The Phoenician Series offers 5-floor plans starting at $329,900 with 2/3 bedrooms, 2/3 baths, study, dining room, living room, family room. Season’s 30,000 square foot clubhouse and sports complex is the center of community social life. The fitness center features state-of-the-art equipment. There is an art studio for those who need a place to be creative. There is a place to play bocce ball, shuffleboard or horseshoes, a pool, spa, an indoor pool, a bar and a fireplace, as well as nature trails and bike paths. Prince Creek also offers amenities to its subdivisions, including a clubhouse, pool, tennis courts, and various trails. Prince Creek is near all the great seafood restaurants and shopping at Murrell’s Inlet. Lawn maintenance, sprinklers and amenities upkeep are part of the HOA fees. If you are planning a retirement that is anything but ordinary you will love the friendship, fun, and adventure at Seasons. Visit our website for more information on new homes in Myrtle Beach and call today for a tour of the homes for sale at Seasons at Prince Creek West.